If you are learning the art and science of welding, then no doubt you have already encountered the question: plasma or oxy? Each method of cutting has its own benefits. 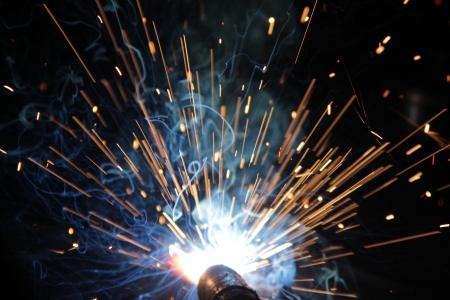 If you are curious about which kind of welding equipment is right for you, don’t hesitate to reach out to one of the expert welders on staff at Sidney Lee Welding Supply Co.
Relying on AC/DC inverter technology, plasma cutters actually create the fourth state of matter in order to generate a fine beam of intense heat energy. The plasma then forms an arc from the torch to the piece of metal you are cutting. Every plasma cutter has an ‘arc starting console’ that sparks from the alternating current through a neutral gas source. Converting the electricity to direct current in the power supply allows the arc to continue providing a constant source of plasma throughout the cutting job. This method is best suited for precision cuts into thin materials including aluminum and steel. One of the unique benefits of plasma cutting is that it creates no oxidization, so the metal retains its clean appearance after the cut is performed. With plasma cutters there is no need to clean up a mess once the cut is made. Great for hobbyist welders, plasma cutters are relatively fast and easy to operate. Choose from the available inventory of Miller Welders at your local branch of Sidney Lee Welding Supply in the Atlanta, GA area. Oxy-acetylene torch cutters have an advantage over plasma cutters when it comes to sheer power: with an oxy torch you can cut through a couple feet of metal when necessary. By contrast, a precise plasma cutter can only work through a couple of inches of material. Another advantage is that, due to their reliance on welding gas alone, oxy-acetylene cutters require no electricity to operate. Of course, usually these days electricity is readily available at welding work sites, so this factor is not likely to sway your decision when choosing the right welding supplies in this category. As mentioned, if you are cutting more delicate metals like stainless steel or aluminum, plasma cutters are ideal, whereas an oxy torch will just blast through such a workpiece without much room for precision. If your work finds you cutting a variety of materials in a range of situations, it is possible you will want to have both kinds of welding machines on hand. Just check out the great selection of welding supplies available at the closest Sidney Lee Welding Supply store.